Surprise was little more than a gas station and few small houses in 1938 when founder, Homer Charles Ludden, a Glendale real estate developer and state legislator, subdivided the rural square mile parcel into low-cost home sites for the area's agricultural workers. He named it after his southeast Nebraska hometown and today, it's a 74-square-mile city on the move. 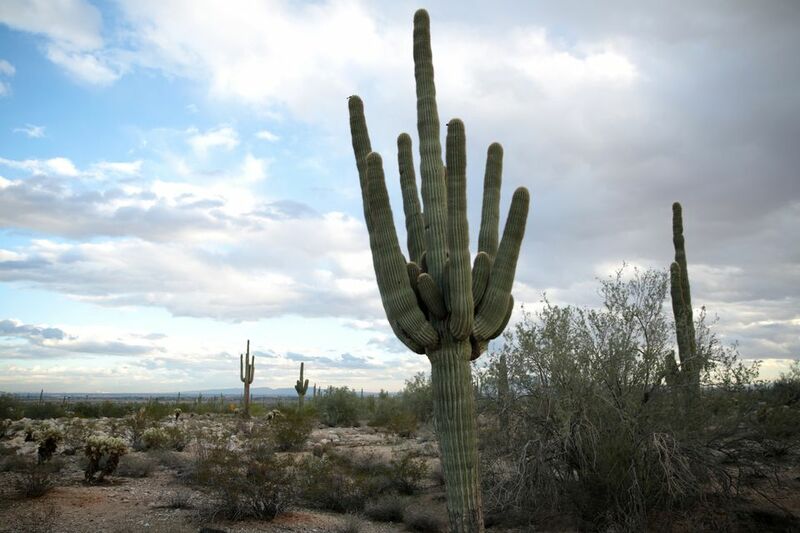 Flanked by one of Arizona's largest mountain preserves and situated in the saguaro-dotted Sonoran Desert on the northwestern edge of the Valley of the Sun, it's no surprise that Surprise was named Arizona's fastest growing city several times after the 2010 U.S. Census. It is one of the 10 most populous cities in Arizona. If you are driving to Surprise (public transportation options are slim to this area), travel time from Phoenix varies; it's always a great day trip from the city. If you'd rather stay the night, there are also many great hotels in the Surprise area. If you're looking for some cool and affordable summer fun, Surprise's 10,562-square-foot Aquatics Center takes swimming beyond the box. It includes a 4,700-square-foot water play area with zero depth entry, eight-lane competitive pool, diving well with two one-meter boards, two slides, a vortex whirlpool, a classroom, concessions, and swim lessons. However, keep in mind open swim hours at the pool are only available during the summer months. You don't need a huge aquatic center to make the little ones happy; they can have all the cool, summer fun they need at one of Surprise's splash pads or water parks. With many public parks free of charge to choose from, you're sure to find a great place for your younger children to play. Splash pads and water parks typically open in late spring or at the beginning of summer and stay in operation until late fall. If you're ready for an outdoor adventure, hike or bike to a rare desert waterfall at White Tank Regional Park located on the western edge of Surprise. Waterfall Trail is a very popular and easy hike, suitable for the entire family. It opens from spring through fall for tourists of all ages, free of charge. The Nature Center on site is open year-round ​but has special summer and winter hours. Surprise is home to seven different professional golf courses, so if you and your family are fans, hit the greens at one of Surprise's championship golf courses. Cimarron at Sun City Grand was designed by Greg Nash, and the Desert Springs Golf Club in the Northwest Valley was one of the original courses at the resort. You can also check out the Arizona Traditions Golf Club, the Granite Falls Golf Club's North and South Courses, the Great Eagle Golf Club, and the Coyote Lakes Golf Club. If you'd rather spend some time playing recreational sports indoors, you can play tennis, racquetball, and table tennis at the Surprise Tennis and Racquet Complex. They have leagues as well as drop-in tennis, and from time to time you can also catch professional exhibition tennis here. The facility sells and rents out equipment and tennis gear and has been ranked by the United States Tennis Association (USTA) as one of the best tennis centers in the nation. A one-stop-shop for family entertainment, Uptown Alley has bowling, laser tag, and games, as well as a full-service restaurant and nightlife opportunities for the adult crowd. This 60,000-square-foot venue also features video games, carnival-type games, live entertainment, and food and beverage services. Spend a day at Maricopa County's Northwest Regional Library. The $5.5 million, 20,000-square-foot library features a gift shop, many public-access flat-screen computers, and separate adult, teen, and child areas with greenhouse reading rooms overlooking a five-acre lake. Even the Kansas City Royals and Texas Rangers decided to take up residence here. The once-sleepy square-mile farming community surprised just about everyone when it successfully courted the two teams away from their Florida training homes. Catch a game for Cactus League Baseball in Surprise. Here, you can see the Kansas City Royals and Texas Rangers in action at their $48-million, 10,560-seat, multi-use stadium. The Cactus League Spring Training facility and stadium, along with a regional library, aquatic center, recreation center, and 57-acre passive park are the centerpieces of the downtown development, putting Surprise well on its way to becoming the playground of the West Valley. Spring training baseball games are held during the month of March. When the holidays roll around, think Surprise. No matter the temperatures, there's always plenty of snow at the City's annual Surprise Party in December as well as fireworks and fanfare on the Fourth of July. Other events like Saint Patrick's Day parades, Valentine's Day Celebrations, and Memorial Day services also take place around the city. Check the official City of Surprise event calendar for up-to-date listings of the city's annual celebrations.